Multnomah Falls is a waterfall on the Oregon side of the Columbia River Gorge, located east of Troutdale, between Corbett and Dodson, along the Historic Columbia River Highway. The falls drops in two major steps, split into an upper falls of 542 feet (165 m) and a lower falls of 69 feet (21 m), with a gradual 9 foot (3 m) drop in elevation between the two, so the total height of the waterfall is conventionally given as 620 feet (189 m). 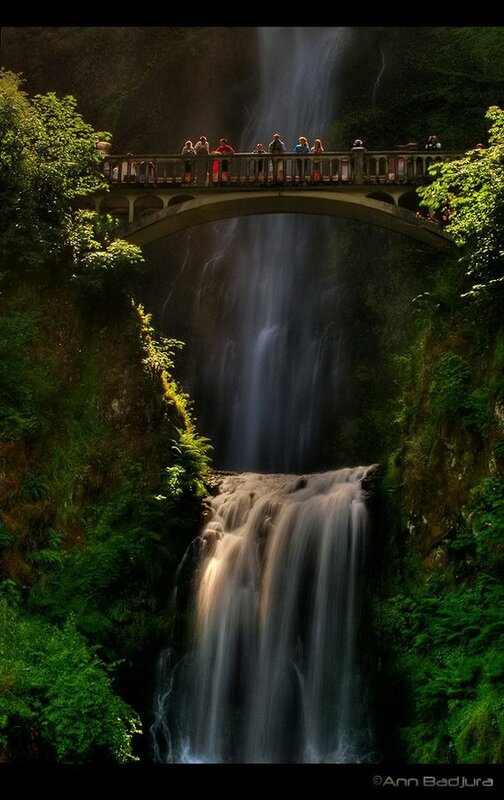 Multnomah Falls is the tallest waterfall in the State of Oregon. It is credited by a sign at the site of the falls, and by the United States Forest Service, as the second tallest year-round waterfall in the United States. However, there is some skepticism surrounding this distinction, as Multnomah Falls is listed as the 137th tallest waterfall in the United States by the World Waterfall Database.